While its raised perch, impressive angles and staircase entry set the tone for a home that commands attention, this 5,212-square-foot Martis Camp home is at the same time very warm, welcoming and easy to settle into. One step through the front door confirms that feeling. Here, you encounter a great room with pocket doors leading to a stone patio with covered dining, lawns, fireplace, barbecue area and views of the forest and Lookout Mountain. The kitchen is ideal for entertaining with the dining room to its left and the great room immediately before it. Behind that kitchen, a hallway leads to the master bedroom with tall ceilings, an oversized bath and a fireplace that throws a warm glow onto those cool, autumn evenings. Upstairs you’ll find two additional bedrooms as well as a foyer that seems ideally suited for a personal office space. Back on the main floor, just beyond the fireplace in the great room, is an artistically impressive, concrete walled entry to the guest wing. The custom staircase leads to a theater room, office, large media room with covered deck and hot tub, a bedroom, and a bunkroom with tall ceilings and four twin beds with views of the pines. 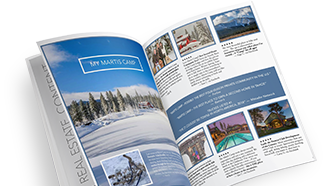 This 5-bed, 6.5 bath Martis Camp estate’s property line nestles up to open space and to trails that wind their way throughout Martis Camp. Not far away is Creekside Park, the Aerial Adventure Park and Lookout Lodge. Complementing the profile of this home is an interior with a spectacular array of style. Cabinets are alder, counters are granite and dekton, and wood floors run the length of the home. The great room is a boldly beautiful assembly of steel panels while the single-stringer staircase is made of wood inlay and hand-forged guardrails. For appliances, you’ll find the quality names of Wolf, Bosch, Sub-Zero and Whirlpool.